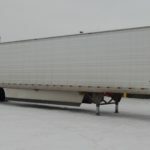 Flat Deck Trailer - Kingpin Trailers LTD. 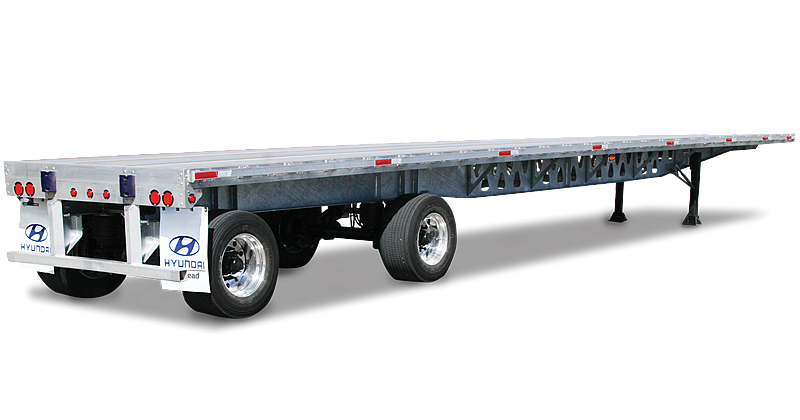 Available in any length, the HT Duralite® offers value and durability for the long haul. Frame Fully hot-dip galvanized frame. Main beam is high tensile steel with a web thickness of 3/16″ and a 3/8″ (100 ksi) flange. Front Plate Aluminum extruded, 6 1/2″ high. Rear Plate Aluminum extruded, 13″ high. Fifth Wheel Plate Nominal thickness of 1/4″ (0.229″), 80 KSI minimum. Kingpin Kingpin located at 36″ from front sill. Side Rails Aluminum extruded profile with integrated winch rail. Aluminum stake pockets, pipe spools, and rub rail. Crossmembers Hot-dip galvanized four inch deep I beam on 16″ centers. Crossmembers bolted to main beam using brackets. Upper Coupler A.A.R. rated king pin, 3-3/8” deep. Floor 1-1/8″ Aluminum with 4 Apitong Nailer Strips. Landing Gear Two speed, 50,000 lb. capacity; A.A.R. rated, with 10″ × 10″ sandshoes with aluminum bolt-on type lower bracing. Roadside crank handle. Underride Guard D.O.T certified. Bolt-on type with perforated 4″ square tube; hot-dip galvanized with recess for conspicuity tape; end cap to prevent slippage. Suspension Hendrickson Intraax AAT23K Air Ride with 121″ fixed spread. Axles 22,500 lb. 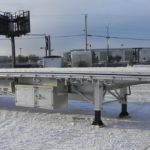 rating, 77-1/2″ track. Brakes 16.5″ × 7″ drum brakes, ‘S’ cam operated automatic slack adjuster. ABS System Two sensor, one modulator valve (2S/1M) system, no diagnostics tool. Oil Seals Stemco Platinum Performance Plus. Paint No Paint on unit. Main beam, crossmembers, and rear underride guard fully hot-dip galvanized. Decals D.O.T. approved Hyundai Translead logo conspicuity tape and FMCSA inspection sticker. Miscellaneous White mud flaps with Hyundai logo mounted behind axles.